A new study by scientists at the University of Bristol has shown that ancient global warming was associated with intense rainfall events that had a profound impact on the land and coastal seas. The Palaeocene-Eocene Thermal Maximum (PETM), which occurred about 56 Million years ago, is of great interest to climate scientists because it represents a relatively rapid global warming event, with some similarities to the human-induced warming of today. Although there have been many investigations of how much the Earth warmed at the PETM, there have been relatively few studies of how that changed the hydrological cycle. 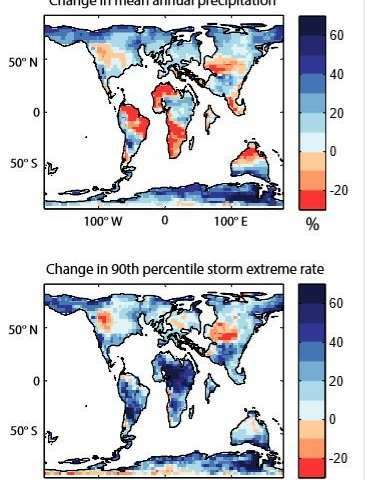 This newly published work shows that rainfall increased in some places and decreased in others, according to expectations, but that much of the world experienced more intense and episodic (or 'flashy') rainfall events. Lead author Dr. Matt Carmichael from the University's Schools of Chemistry and Geographical Sciences, said: "With the same climate models used to study future climate change, we studied how a doubling of carbon dioxide concentrations would affect rainfall patterns on a world with Eocene geography. "This increased the overall global precipitation—warmer air holds more water. But it also changed the pattern and frequency of extreme events. "The tropics became wetter and the incidence of extreme events increased, by as much as 70 percent in some tropical regions. "In other places, total annual precipitation and the number of extreme events became decoupled; in other words, they became drier, with less frequent but more extreme events. All of this illustrates the complexity of how global warming will affect our local, regional and global rainfall patterns." Co-author Professor Rich Pancost from Bristol's School of Earth Sciences, explained how these findings agree with a range of geological and chemical features of the Palaeocene-Eocene global warming. He said: "This warming event is associated with major changes in how soil and sediment were eroded and moved around the landscape. "In many places, river systems that had been transporting silt or sand became associated with fist-sized rocks or even boulders; and more sediment was transported to and buried in coastal margins. In some locations, the rate of sediment accumulation increased by a factor of ten. But at the same time, there is also evidence that these systems became more arid. "Our climate simulations reconcile this for many locations, showing an increase in aridity with fewer but more intense rainfall events. Those events were likely responsible for increased energy in these systems, moving around more material and larger objects. Ultimately it flushed more sediment to the ocean, causing eutrophication, blooms of algae and in some cases hypoxia." Co-author Professor Dan Lunt from the School of Geographical Sciences added: "There are many similar events in Earth history, where warming appears to have been associated with changes in rainfall and sedimentary systems. "Although we have not investigated them here, it is very likely that our results are translatable—because the physics that underpins them remains the same. Thus, the collective body of research confirms that global warming in the past and the future will be associated with more 'flashy' rainfall, with implications for flooding and water management." Professor Pancost said: "Past climate has lessons for our future. Not only do the models show evidence for more intense rainfall events—with all of the implications that entails—but they are consistent with all of our other data. "In fact, they explain inconsistencies in our other data and confirm some long-established hypotheses. In doing so, they foreshadow our potential future with complex and dramatic changes in rainfall, more flooding and more soil erosion."